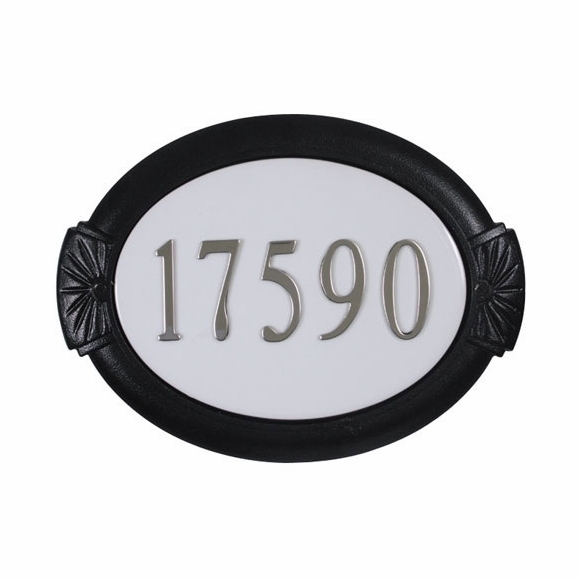 Personalized Oval Address Plaque - - decorative house number sign holds up to five 3" numbers. Frame comes in sixteen different colors. Frame colors: black, burgundy, champagne, smooth glossy black, evergreen, textured beige, gunmetal, mocha, white, oil rubbed bronze, brushed aluminum, hand rubbed bronze, frosted umber, verde green, copper, swedish silver. This oval address sign coordinates with our Contemporary Wall Mount Mailbox and Vertical Mailbox with Newspaper Scrolls (see Related Products).